Earn $11.89 in Podium Club credit (1189 points)What's This? Free to be the fastest. 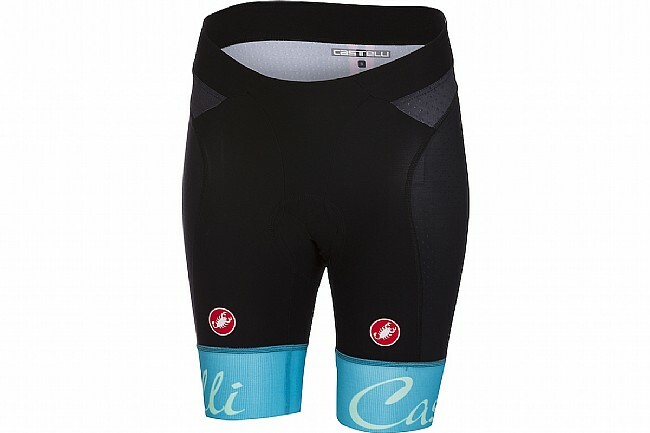 When it comes to riding at your limits, the Castelli Women's Free Aero Short is designed to help you push through to the very edge. This ultimate race short, offering extreme comfort and performance to competitive and recreational cyclists alike, features high-tech Vortex fabric on the sides and back that's dimpled for aero performance and breathability. On the inner leg, 30% Lycra® Forza fabric is extremely flexible for a perfect fit, and wide raw-edge GIRO AIR leg grippers are thin, lightweight, and provide evenly distributed support for comfort that doesn't restrict or distract. This high-end short from the premium Rosso Corsa line uses a women's-specific Progetto X2 Air seat pad with a ventilated skin-care layer so it stays cool no matter the conditions. Multi-density padding is specifically placed for optimum comfort, and the pad is anatomically shaped to relieve pressure and prevent irritation. Flat-lock stitching throughout. Reflective details on back. Claimed weight is 126 g (size small). Also available in a bib version. High quality shorts that are very comfortable. Fit is good but the chamois is insufficient density and thickness for more that 1 hour ride. My shortest ride is usually 2 hours and I found that, when I wore these shorts on consecutive days of 60 mile rides, I got saddle sores. Never before with other chamois. So...ok comfort for an hour but don't rely on them for anything more. Fits nicely but leg grippers itch a little. No clue why. I would not buy these again. I ride between 150-200 miles per week. Was looking for a new short after LG changed their Neo-Power short & this is the one! Feels good, looks good, I bought 4 pairs. Maybe some more color choices?